An Excuse To Be A Kid Again – Hi Blog! I'm Dad. I don’t feel like an adult in my head. Maybe it’s just me, but every grown-up decision I have to make is done so with almost a sense of play-acting. This is the job for an older person, but they’re not here and these are my own responsibilities. I guess I have to do it. Random nonsense and insanity just come to me more naturally. The bizarre humor that rushes through my head is decades below my own age group and doesn’t even need an audience to spring up. Simple stuff. Just shove that in the backpack and be on your way. I pictured my daughter’s teacher reading it in confused shock. I imagined the uncomfortable phone call that would follow. Hi, uh…Mrs. Guttman? This is Olivia’s teacher. Why do you want me to send you $45? The note asking me for $45! Needless to say, I doubled over in hysterics as if another person, rather than my own subconscious, was telling me all of this. I genuinely could not stop laughing for a full minute. It was embarrassing. Luckily no one was awake to see it. Unluckily, I felt the need to share this whole thing with my wife later in the day, who just looked at me blankly. I couldn’t keep myself from laughing like a lunatic as I told it and even the contagious nature of my giggling couldn’t get the sheer genius of my comedic mind across. Olivia thought it was funny though. Then again, Olivia is eight and that’s sort of the problem. Our senses of humor are perfectly aligned. I tell myself that she must be very mature for her age. It beats the alternative. Then again, it’s hard to convince myself that I’m not a giant kid when I think about how I spent two weeks stretching clear tape across doorways in my house all so I could trick my family members into walking into them. Olivia managed to avoid the trap a hundred times. It was the hundred and first time that got her. I laughed my head off. She did too. I have so many videos of her screaming as I jump out in an Incredible Hulk mask or from beneath a pile of dolls. When she was in first grade, she had to fill out one of those Father’s Day questionnaires. For the end of the statement, “I like when my dad…”, she wrote “…scares me.” I don’t know if I was relieved or concerned over the fact that I didn’t get a teacher phone call for that one. As is usually the case with a post like this, I imagine that many people think my son isn’t involved in our ridiculous world. The fact that he’s non-verbal keeps him from understanding many traditional jokes or pranks. Lucky for us, not all of our jokes are traditional. If I had to pick the best one, though, it would be the pullback game. It was discovered on accident, took real commitment, and could have very well gone the wrong way. Basically I grab him as he’s running around at a fever pace. I hold him tightly in place until he desperately tries to squirm away. At that point, I let go. Go ahead. You can go. The second he starts to get up, I grab him with both arms and pull him back in. Oh no you don’t! Get back here! Ah ha ha! But, as I mentioned, I’m not all that mature…and this game is more certainly not over. He scoots off my lap, takes a step, and gets yanked right back again as I maniacally cackle. Nah ah! No no no! I got you! This gets the biggest laugh of them all. It’s one of the weirdest games we play because it seems to fly in the face of basic parenting. 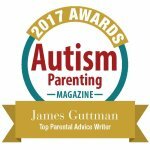 Whether your child is on the Autism spectrum or not, you’re supposed to end the game when they tell you to end the game. Yeah? Not in my house, kiddo. For anyone with a lost childhood or moments they wish they could have back, parenthood is a second chance. You can be the kid you wanted to be and get applause for doing so. Sure there are tough grown-uppy decisions to be made and you should make them in a tough grown-uppy way. Once you’re done with that, though, go back to having fun. It’ll keep you feeling young…even when the rest of the world is intent on making you feel old. I’m not sure I needed an excuse to be a kid again. I’ve been a musician all my life and that’s always been a strong connection to being playful! I’ve started following you on Twitter and look forward to reading more of your posts in the future. That’s an awesome story! I would be just as proud in your position. Blaming a pet for gas? That’s a milestone right there.